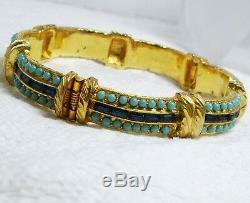 RARE Vintage signed DENICOLA Faux Turquoise & Sapphire Blue Rhinestone BRACELET. RARE Vintage signed DENICOLA Tiny Faux Turquoise Cabochon & Sapphire Blue Rhinestone Baguette Hinged BRACELET. Inner circumference measures 7" x 6/16", total weight 40 grams. (images enlarged to show detail). Some light loss to the gold tone finish. The vintage/antique items will show wear commensurate with age and wear and any major flaws will be noted. The photos can be enlarged for a closer more detailed look and they are taken for your viewing and should be considered part & parcel of the description. All items are described to the best of my ability & knowledge. The item "RARE Vintage signed DENICOLA Faux Turquoise & Sapphire Blue Rhinestone BRACELET" is in sale since Friday, May 10, 2013. This item is in the category "Jewelry & Watches\Vintage & Antique Jewelry\Costume\Designer, Signed\Bracelets". The seller is "oreillyfactor1" and is located in New York, New York. This item can be shipped worldwide.